Are you looking for an economical washing machine? You’ve reached the right page because I am going to share to you the latest washing machine that I’ve used at home that is economical and reliable when it comes to washing different kinds of cloth. This is the LG 6 motion Direct Drive Inverter Washing Machine. My family is so glad that we did the right choice in buying the excellent washing machine for our family. Normally, we do not have helper at home and even if we have, we are still having problems washing big and heavy blankets. Our old washing machine doesn’t have the capacity to wash heavy laundry and it already has an issue with spin dry. As my family grows, washing load becomes bigger too. We consider buying new appliances for our home as an investment that is why before we buy we make sure that it fits in our needs, very reliable, economical, and most importantly it fits in the budget. Why investment? 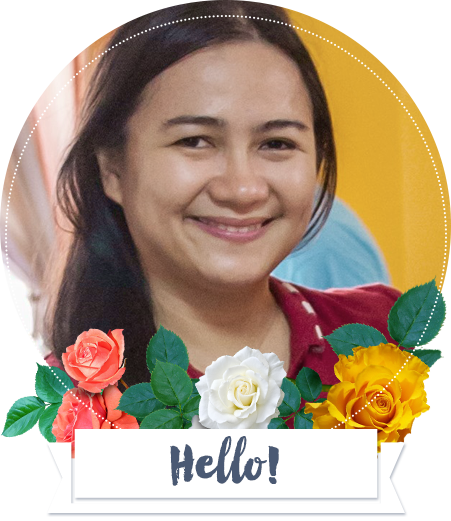 Because the appliances that we buy will definitely help us at home that will bring comfort to our family. My husband and I talked about what washing machine we need – 10-12Kg capacity with latest technology, excellent features and functionality – different types of wash capabilities, durable, and it should be very economical. Perfect! This is right in time. 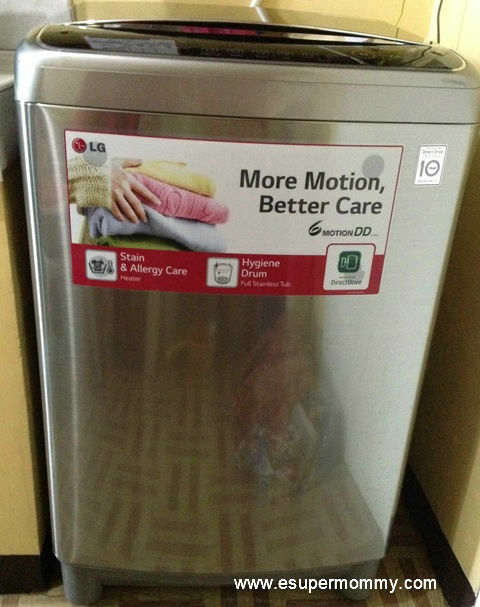 We spotted LG 6 Motion Direct Drive Inverter washing machine. We read, watch reviews and asked almost four appliance shop before we decided to buy this washing machine. We actually wanted the other popular brand of washing machine but after finalizing what we’ve learned, we bought the LG 6 Motion Direct Drive Inverter washing machine. How excited I am the first time we unboxed the LG 6 Motion Direct Drive Inverter Washing Machine. It’s actually a relief from heavy washing. This is a top load washing machine that has a digital panel on top which makes it easy to use. What is the LG 6 Motion Direct Drive? This has something to do withwashing performance such as rubbing, swing, wave force, compressing, rotating, and agitating. LG 6 Motion Direct Drive Inverter Washing Machine has hygiene features with full stainless steel tub. It is more effective to control bacteria growth than conventional plastic tub washer. It protects the fabric and prevents damages. Why should you consider buying LG 6 Motion Direct Drive Inverter Washing Machine? Inverter Direct Drive motor – it has a low noise direct drive system that uses advanced brushless DC motor which rotates the tub directly without belt and clutch. Smart diagnosis – technology to transmit anomalies to the service center when there is a problem with the washer. After a month of using this washing machine, I compare my electric and water bills from last month’s bill. Yes! I love the inverter technology because my electric bill just increases in less than P200 meaning it is economical. Imagine, I use this washing machine twice-thrice a week in washing big and heavy blankets sometimes using Duvet, and I also use high in spin dry. My water bill is still the same so it means that Duvet and normal wash does not consume a lot of water. Because my children love to smell their blankets before sleeping, I’ve noticed that they really like their blankets because it was so clean, smells so nice, and the fabric felt so pleasant on the skin. In washing blankets, usually for this 12 kg capacity, it can wash up to 7-8 blankets in one wash. This is my regular routine at home. Just make sure to follow the number of scoops that you will use for laundry powder soap and also do not over fill the fabric conditioner level. Pour the suggested amount of liquid fabric softener into the right-hand compartment. 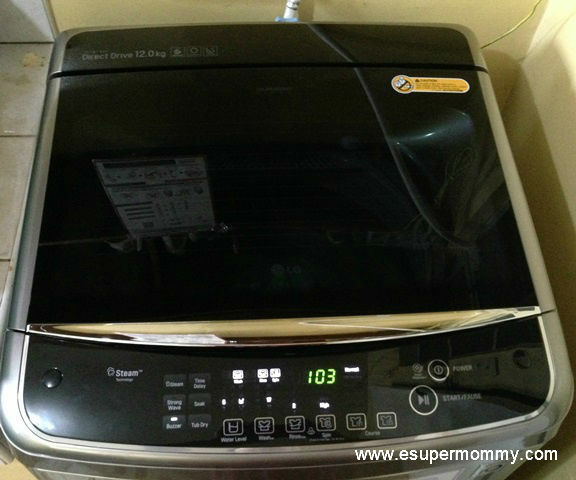 Overall, I would highly recommend this LG 6 motion Direct Drive Inverter Washing Machine. It is very reliable, economical, and I very much like how LG technology evolved in this washing machine. Thank you so much LG appliances! I am so happy that this washing machine has been a great help to my family. Update: After six months of use, this washing machine is still performing well. It is low in maintenance and I think very durable. In terms of power consumption, our electric bill’s cost is not high. This is because of the inverter technology of this washing machine and it is a direct drive. Hindi ba yan nakakasira ng damit because of the stainless tub? nka connect na ba yan directly sa water supply? Di naman siya nakakasira ng damit usually nasa regular washing program lang ang gamit namin.